This week, I wanted to let you know about my running progress and also tell you about the tool I've been using to track my running and workouts. Once upon a time I was a dailymile devotee, logging countless miles on the site, talking to other runners about training, and gleaning advice that helped guide me through my first half and full marathons. It was a very helpful tool and I highly recommend it. However, it got to the point where I was spread too thin in the social network department and realized I needed to make some cuts. Dailymile was the first to go. Instead, I started using RunningAhead, which my friend Chip recommended. 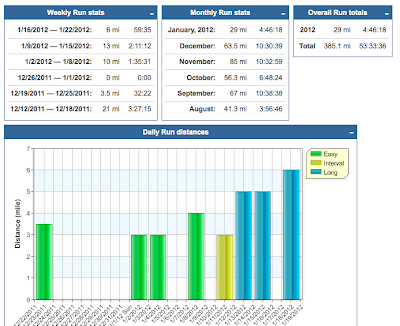 RunningAhead lets you keep track of a variety of exercises, but it really shines when it comes to running. You can enter different kinds of workouts (tempo, long run, intervals) as well as race results, and it will keep a handy tally of your cumulative miles for the week, month, and year, as well as a list of personal records. 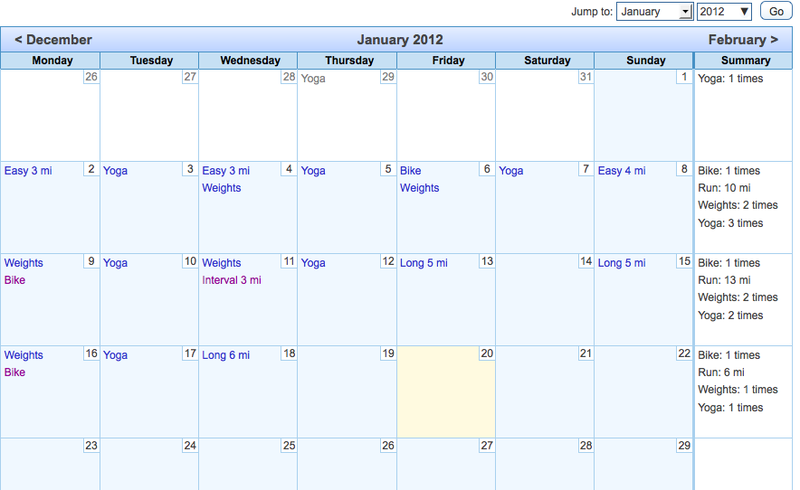 You can also look at your training laid out on a calendar (see screenshot above) which is helpful. There is an option to make your account public so you can share it with others, but since I was trying to limit my social networking I opted to keep mine private. 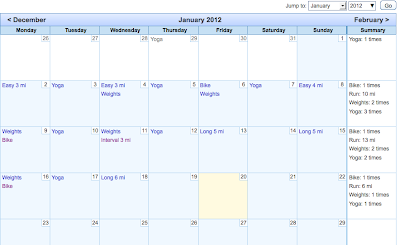 I've been using RunningAhead for about a year and have found it suits my needs (keep track of everything! no funny people distracting me from work! pretty charts and graphs!) very nicely indeed. It's also free, so check it out! Monday: Kettlebell/Spin at the YMCA. That's 30 minutes of kettlebell followed by 30 minutes of spin. Does anyone else hate spin as much as I do? It's so brutal and I feel like my heart is going to explode out of my chest, fly across the room, and knock the instructor off her bike. Sometimes - especially during hill repeats - I sort of wish it would. Tuesday: Vinyasa flow at the YMCA. My shoulders and chest were killing me from kettlebell and all those chataraungas did not help. Wednesday: Long, slow run for the week. I moved it up to Wednesday because I was still too sore for kettlebell and wanted to give my upper body a break. I covered six miles at an average pace of 9:56. Thursday: Rest. Thursdays are my busiest day of the week and I think they will often be rest days. Might be a good idea to continue doing long runs on Wednesday, if that's the case.